Recently, I had my students to complete a self-reflection in which I asked 'what is one skill you would like to walk away from the semester with?' 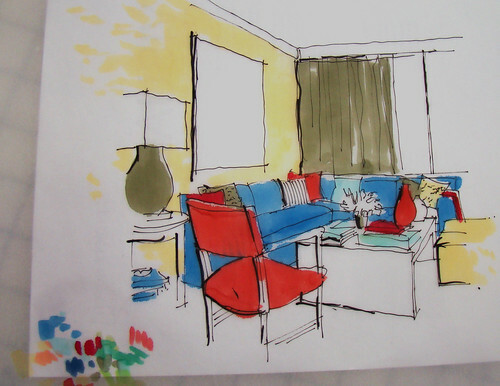 One of the best answers I received was 'to draw like Candice Olson of Divine Design'. Wow...me too! 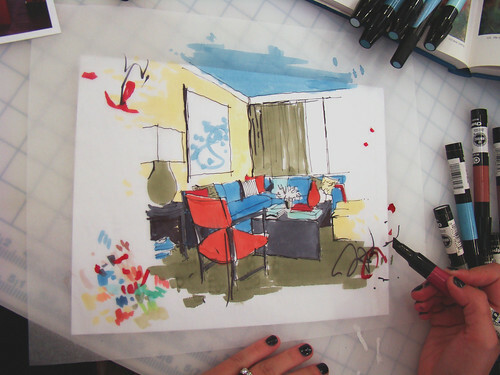 Of the many designers making a career on television, Candice stands out in her ability to represent design ideas on paper through incredible hand renderings. This, in my opinion, makes her the real deal. Below is a demonstration I gave students, based off a drawing method featured at the end of Divine Design, where a space is rendered from a photograph. In the assignment that grew from this demo, I encouraged students to draw one space several times, experimenting with color combinations to see what works and what does not. For this exercise, we'll work backwards. I'm beginning with an image from a magazine, but you can work from a photo or digital model of any space you would like to see 'updated'. The first step is easy. 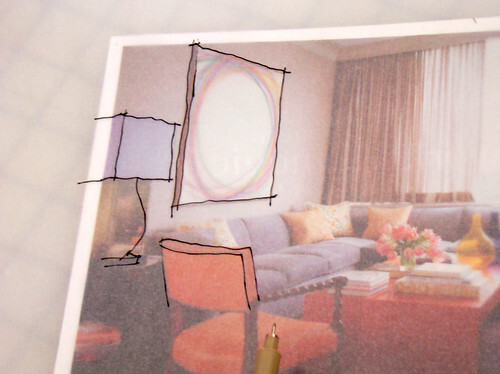 Place a sheet of translucent paper over your image and trace what you see. 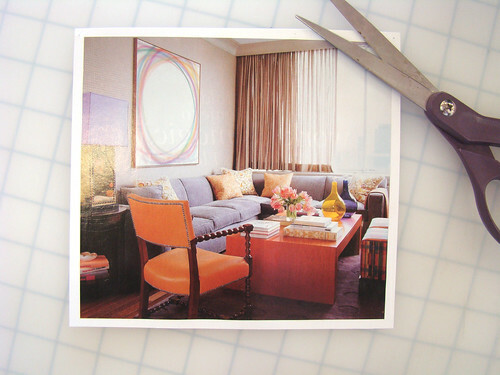 Don't worry about having rigidly straight lines. Exactness is not the goal, but rather expression. You'll notice, especially around the painting hanging on the wall, my lines extend beyond the boundaries of what I'm tracing. This aids in the crispness of the drawing. Feel free to change elements of the room at this point. There is no reason you can't make your own design decisions. Go ahead, add some tchotchkes! Once finished with this step, I add some thicker lines using a wider tipped pen. I choose to add these thicker lines to surfaces and edges where I assume shadows will be. I've identified these areas based on the assumption that light is coming in through the window. However, this is where a photo reference can help. I then begin applying color with a Chartpak AD marker. I work quickly as the marker dries fast on the trace paper. It also helps maintain the loose look I'm working towards. I like to embrace the process that goes along with this type of drawing. As a result, I test out the markers along the side of the rendering, with the intention to leave these trials in my finished presentation. I also joke with students about my unruly hand which can't help but leave marks all around the outside of the image. With the base colors down, it is time to add some shadow. Because of the nature of the paper and markers, if I were to try to add shadows on the front of the paper, the strokes would become diluted. Instead, I flip the paper over, adding dark areas to the backside which while shine through to the front. The result is a loose and quick vignette. This one took about 15 minutes from start to finish. A great way to present ideas in a hurry, this drawings can be further enhanced (and toned down a notch...or two) in Photoshop. Find this helpful? If so, please share the link with you friends! See a past, tighter marker tutorial here. That is extremely interesting. Especially adding the heavier darker lines, and shading from behind the drawing. 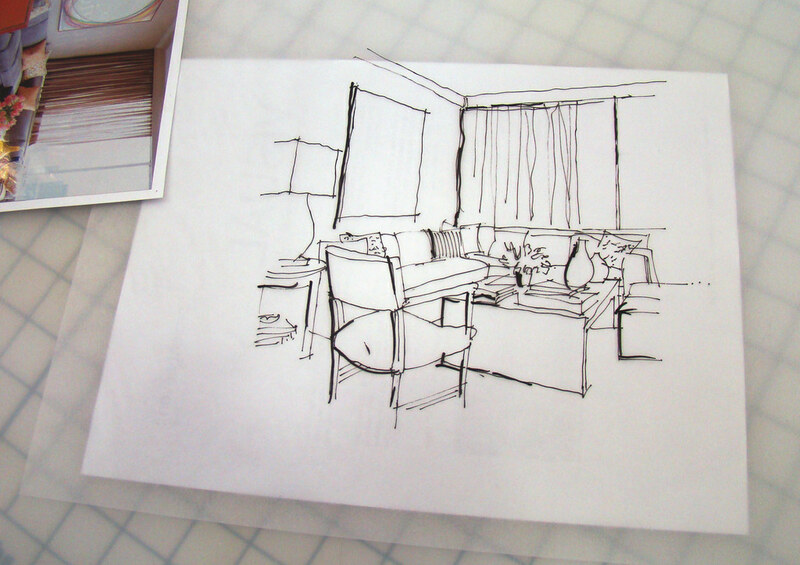 Do you have any tips on drawing the sketch without tracing a photo? I am an interior design student trying to improve and loosen up my interior sketches. I read your blog every day, and really admire your drawings. I love this! 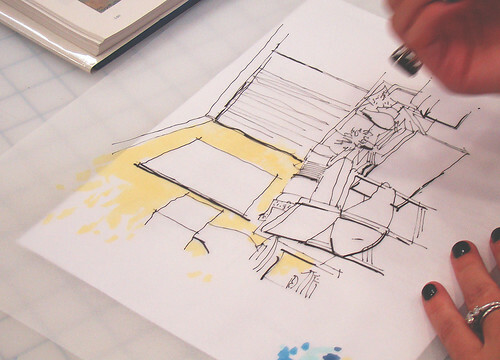 Doing sketch renderings on trace paper is one of my favorite things, and I'm glad you're doing it too! Your students have no idea how lucky they are to have you- my drawing teacher chewed me out for doing a drawing on trace (it was a practice assignment too). She said we needed to have pride in our work and trace paper looks bad. Goodness. So...that's how they do it!FABULOUS! I have absolutely no drawing talent whatsoever. My pictionary drawings are legendary in my family for their utter horrible-ness. That said, your talent and skill amaze the crap out of me. I sit here in awe. Thanks for showing how it's done. this is a terrific tutorial and i'll link to it in my next post! i really like your skecth!! Cool! I love your drawing style. If you ever have the inclination, I'd love to see a tutorial on how you approach your street scene sketches. Cheers! Wonderful and so helpful! I agree with Mike, above. I would LOVE to see how you do street sketches so I can hopefully learn from you! Oh my wow. I just LOVE this! Such a great tutorial!! Love this! Very informative. Thanks for sharing. Thank you for sharing, I am going to have my students try their hand at this on their dreaded 1 point perspective drawings. They normally stop at line; this looks like it would be a fun way for them to jump into color. This is a wonderful tutorial! Am I getting this write? 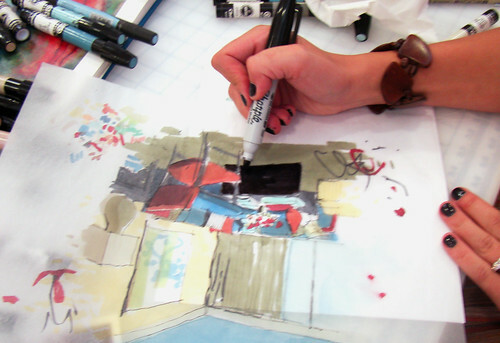 Is this drawing done on tracing paper? Or is Translucent paper different? It must be thicker? I found your blog today. It looks very interesting. I love this post. I hope to see other post where it teaches you how to render. Thank you!!! I love this! yes, quite similar...I just wanted people to know there are tricks...you don't have to be a realist painter to do this. 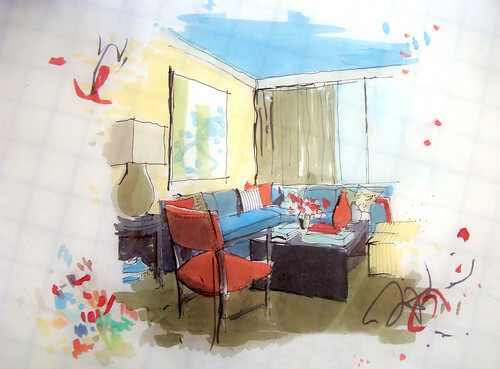 I like the bright colours in this rendering, and love the style!!! Your style that is! You have an amazing eye! My class loved this...you are my guru!